Take to the water in style and comfort with our Zoggs Fusion air lady dark lens goggles pink. Not only does this goggle look great, it’s also choc a block with features to ensure that you feel great too. Air filled gaskets made from high quality silicone provide a 'cushioned' seal which gives a lightweight and comfortable fit. Built-in anti-fog and UV protection also feature in this goggle, while the smoke tint lenses offer added protection from reflected light. A practical solution for changeable conditions and everyday training. Note: we advise you to test on 'dry' if the swimming goggles fit properly, before using them in the water (return is not possible after use in the water). The Zoggs Aqua flex dark lens goggles black/orange offer the unique 4 Flexpoint technology for enhanced frame flexibility providing a contoured and comfortable fit. This lens will also features a 180 degree peripheral vision offer fantastic vision. The Aqua-Flex offer maximum UV protection, Fogbuster anti-fog for fantastic clarity and Zoggs new Soft-Seal Plus hypo-allergenic frame made from liquid silicone for an ultra light face contouring fit and comfort. Note: we advise you to test on 'dry' if the swimming goggles fit properly, before using them in the water (return is not possible after use in the water). The Zoggs Aqua flex dark lens goggles blue offer the unique 4 Flexpoint technology for enhanced frame flexibility providing a contoured and comfortable fit. This lens will also features a 180 degree peripheral vision offer fantastic vision. The Aqua-Flex offer maximum UV protection, Fogbuster anti-fog for fantastic clarity and Zoggs new Soft-Seal Plus hypo-allergenic frame made from liquid silicone for an ultra light face contouring fit and comfort. Note: we advise you to test on 'dry' if the swimming goggles fit properly, before using them in the water (return is not possible after use in the water). The Zoggs Aqua-Flex Titanium dark lens goggles black/green offer the unique 4 Flexpoint technology for enhanced frame flexibility providing a contoured and comfortable fit. New titanium lenses feature added protection from reflected light to reduce eye fatigue. This lens will also reduce glare and soften the visual experience when swimming indoors, and combined with 180 degree peripheral vision offer fantastic vision for both indoor and outdoor swimming. Aqua-Flex also offer maximum UV protection, Fogbuster anti-fog for fantastic clarity and Zoggs new Soft-Seal Plus hypo-allergenic frame made from liquid silicone for an ultra light face contouring fit and comfort. Note: we advise you to test on 'dry' if the swimming goggles fit properly, before using them in the water (return is not possible after use in the water). The Zoggs Predator clear lens goggles blue/grey offer fantastic durability with a unique Bio-Tech frame technology, a long lasting design with soft silicone gaskets offering a superb and comfortable fit. The double band strap is easy to adjust and significantly reduce pressure around the eyes. The lenses offer CLT Curved Lens Technology for 180 degree peripheral vision, Fogbuster anti-fog and maximum UV protection for fantastic clarity. Note: we advise you to test on 'dry' if the swimming goggles fit properly, before using them in the water (return is not possible after use in the water). The Zoggs Predator blue lens goggles grey/white offer fantastic durability with a unique Bio-Tech frame technology, a long lasting design with soft silicone gaskets offering a superb and comfortable fit. The double band strap is easy to adjust and significantly reduce pressure around the eyes. The lenses offer CLT Curved Lens Technology for 180 degree peripheral vision, Fogbuster anti-fog and maximum UV protection for fantastic clarity. 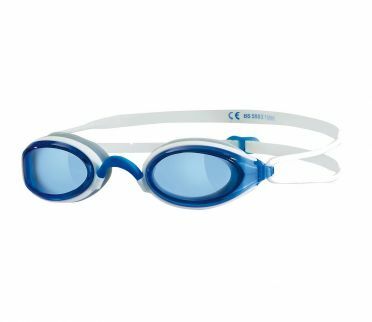 The specially designed blue lenses reduce blinding and ensure a great vision during outdoor swimming or swimming in bright light. Note: we advise you to test on 'dry' if the swimming goggles fit properly, before using them in the water (return is not possible after use in the water). The Zoggs Predator dark lens goggles white offer fantastic durability with a unique Bio-Tech frame technology, a long lasting design with soft silicone gaskets offering a superb and comfortable fit. The double band strap is easy to adjust and significantly reduce pressure around the eyes. The lenses offer CLT Curved Lens Technology for 180 degree peripheral vision, Fogbuster anti-fog and maximum UV protection for fantastic clarity. 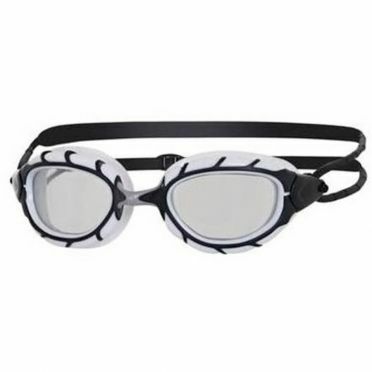 These goggles are ideal for indoor swimming and low level light conditions. Note: we advise you to test on 'dry' if the swimming goggles fit properly, before using them in the water (return is not possible after use in the water). Take to the water in style and comfort with our Zoggs Fusion air dark lens goggles green. Not only does this goggle look great, it’s also choc a block with features to ensure that you feel great too. Air filled gaskets made from high quality silicone provide a 'cushioned' seal which gives a lightweight and comfortable fit. Built-in anti-fog and UV protection also feature in this goggle, while the smoke tint lenses offer added protection from reflected light. 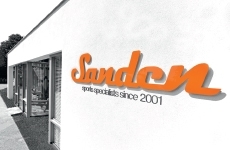 A practical solution for changeable conditions and everyday training. Note: we advise you to test on 'dry' if the swimming goggles fit properly, before using them in the water (return is not possible after use in the water). Take to the water in style and comfort with the Zoggs Fusion air blue lens goggles blue/white. Not only does this goggle look great, it’s also choc a block with features to ensure that you feel great too. Air filled gaskets made from high quality silicone provide a 'cushioned' seal which gives a lightweight and comfortable fit. Built-in anti-fog and UV protection also feature in this goggle, while the blue tinted lenses offer a little added protection from reflected light. Perfect for indoor swimming. Note: we advise you to test on 'dry' if the swimming goggles fit properly, before using them in the water (return is not possible after use in the water). The Zoggs Fusion air gold mirror goggles green/blue, featuring Air Cushion Technology in the gaskets providing a cushioned seal which gives an 'almost not there' fit which is designed to give secure and contoured suction and significantly reducing markings around the eye. 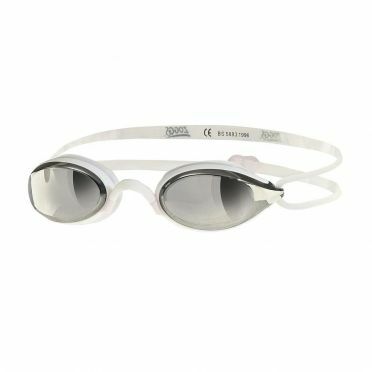 The mirrored lenses are ideal for direct sunshine and bright conditions, reducing glare and reflection of the sun to make these goggles ideal for swimming outdoors. With Fogbuster anti-fog providing exceptional moisture control, 180 degree peripheral vision and maximum UV protection built into the lenses, nothing can hold you back in these striking low profile goggles. Note: we advise you to test on 'dry' if the swimming goggles fit properly, before using them in the water (return is not possible after use in the water). The Zoggs Phantom tinted goggles green offer fantastic comfort with Soft-Seal hypo-allergenic frame which moulds to the contours of the swimmer’s face giving a superb customised fit whilst retaining softness to give a ‘second skin’ style comfort. You can achieve fantastic clarity with maximum UV protection and Fogbuster anti-fog which combined with the tinted lens ensures excellent vision when swimming outdoors. 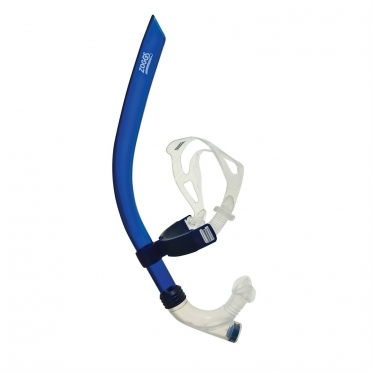 The split-yoke strap reduces pressure on the swimmer’s face and also features an easy-adjust mechanism making it even easier to get the perfect fit. Note: we advise you to test on 'dry' if the swimming goggles fit properly, before using them in the water (return is not possible after use in the water). 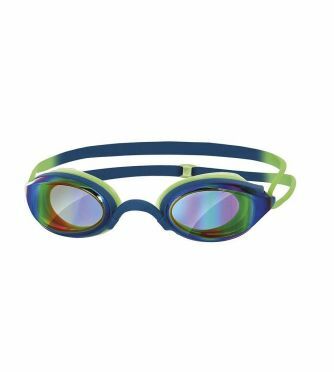 The Zoggs Phantom clear goggles green offer fantastic comfort with Soft-Seal hypo-allergenic frame which moulds to the contours of the swimmer’s face giving a superb customised fit whilst retaining softness to give a ‘second skin’ style comfort. You can achieve fantastic clarity with maximum UV protection and Fogbuster anti-fog which combined with the clear lens ensures excellent vision when swimming indoors. 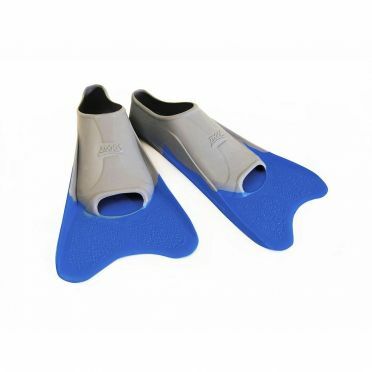 The split-yoke strap reduces pressure on the swimmer’s face and also features an easy-adjust mechanism making it even easier to get the perfect fit. Note: we advise you to test on 'dry' if the swimming goggles fit properly, before using them in the water (return is not possible after use in the water). This Zoggs Swim training combi package is the optimal package to improve your swimming techniques. 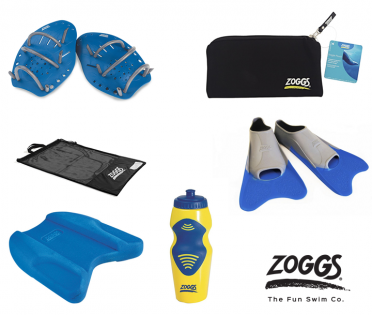 This combi package consists of the following products from Zoggs: Ultra blue finz, Matrix hand paddles, Kick Buoy, Goggle pouch, Aqua sport bottle and Carry all bag. Stand out from the crowd! The Zoggs Predator goggles white/black - dark lens allow for great visibility as well offering a super stylish look and feel. The Wiro frame makes these goggles top quality with contoured lenses and easy strap system. The large Wiro frame allows for a super comfortable fit and the CLT, Curved Lens Technology, provides you with 180-degree peripheral vision. Note: we advise you to test on 'dry' if the swimming goggles fit properly, before using them in the water (return is not possible after use in the water). Zoggs centre snorkel blue Encourages focus on stroke technique without swimmer turning their head to breath. Stand out from the crowd! 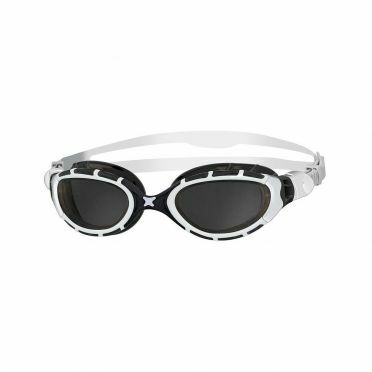 Zoggs Predator flex 2.0 goggles white/black allow for great visibility in the brightest conditions as well offering a super stylish look & feel. The Zoggs Predator Flex goggles offer a unique 4 Flexpoint technology for a contoured and comfortable fit. This means that the flex points allow the frame to flex to the face, and the nosebridge to flex around the nose and eyes, making them a super comfortable fitting goggle for every face shape.